Umble Center was filled on Sunday night for the presentation of the sixth annual Goshen College Monologues. Monologues is a space created for women and non-binary students and faculty of GC to share stories and experiences. During the fall semester, women and non-binary people submitted a monologue to the steering committee, who then reviewed the stories and assigned them to cast members during the spring semester. People’s stories are shared anonymously. This year, there were stories about identity, relationships, sexual assault, mental health, body image and friendship. Including the committee members, 25 people made up the cast. The steering committee included seniors Hannah Friesen and Emily Stoltzfus, juniors Stephanie Dilbone, Sophia Martin and Rachael Klink and sophomore Genevieve Cowardin. Klink said the process of planning Monologues started in September with advertising, followed by collection and editing of the monologues and then doing the cast call and preparing the Monologues performance. This year for the first time, cast members performed movement pieces in the middle of the first and second half of the performance. The committee incorporated these movement pieces to create space for the audience to reflect and process. 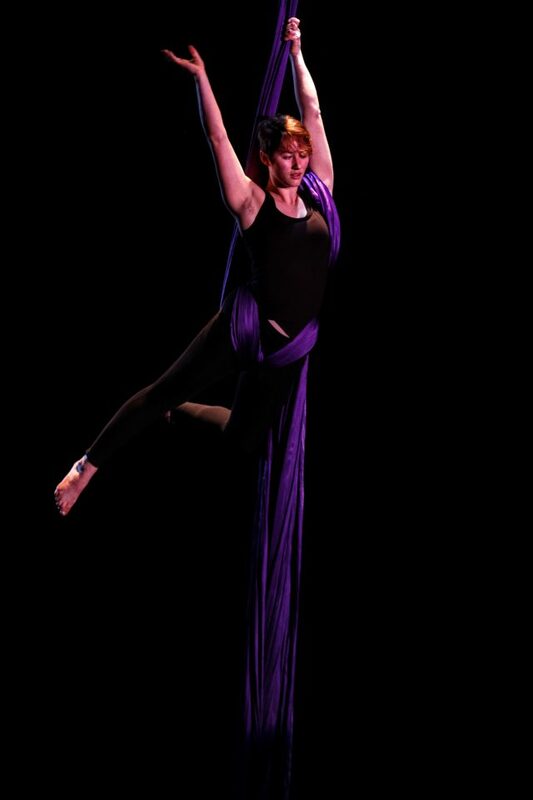 Right after the sexual assault section, which was the conclusion of the first half of the performance and led into intermission, Elena Meyer Reimer, a first-year, performed an aerial silk routine. Another addition the Monologues committee made this year was a talk-back session directly following the performance. This was done to create a space for audience members to share their thoughts, questions and reactions. Regina Shands Stoltzfus, associate professor of peace, justice and conflict studies, facilitated the discussion. Friesen agreed that it was challenging to decide how to include certain monologues. “The most rewarding part for me this year was getting to see people responding to the monologues in the processing space we hosted after the performance,” Friesen said of the talk-back session. She said the fact that a conversation was started shows that the students, faculty and alumni of GC are taking important steps in understanding each other’s experiences and advocating for social justice.